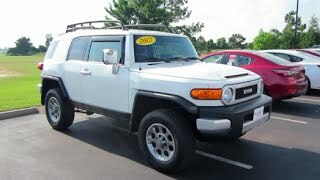 The Toyota FJ Cruiser uniquely melds the brand’s off-road performance legacy with distinct heritage design in a modern SUV.Even with its considerable off-road capability, the 2012 Toyota FJ Cruiser offers comfortable everyday usability and Toyota reliability. The trail-oriented Trail Teams Special Edition Package incorporates a standard Off-Road Package and for 2012 is available in a new color, Radiant Red. 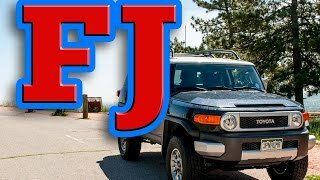 With the optional Class Four receiver hitch, the FJ Cruiser can pull a trailer up to 5,000 pounds, enough to take the fun with it, such as a pair of watercraft, a powerboat, dirt bikes or even a racecar. 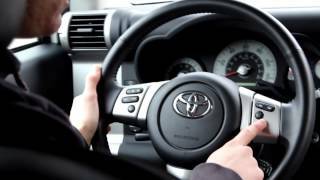 On pavement or off, the 2012 FJ Cruiser offers fully civilized audio and connectivity features. The standard audio system includes an AM/FM CD player with MP3/WMA playback capability, six speakers, XM Radio (includes 90-day trial subscription), auxiliary audio jack, USB port with iPod® connectivity, plus hands-free phone capability and music streaming via Bluetooth® wireless technology. The steering wheel integrates audio system and Bluetooth controls for added ease of use. A JBL® 10-speaker premium audio system, including sub woofer, is optional (standard on Trail Teams Special Edition). The 2012 FJ Cruiser Trail Teams Special Edition sports a monotone Radiant Red exterior and projects a tough, slightly menacing look, accentuated by black bumpers, front grille and door handles. On the roof, new off-road lights with an air dam improve long-range visibility and enhance visual appeal.On the inside, new red accents on the door trim, steering wheel and fabric seat inserts complement the exterior styling. The look is backed up by Trail Teams capability. Under-hood, a cyclone pre-air cleaner (standard on all models) is effective at trapping sand and dirt and is easy to clean. The package beefs up chassis performance with trail-tuned Bilstein® shock absorbers; rear differential lock and the active traction control (A-TRAC) system; engine, fuel tank and transfer cases; skid plates; rock rails; plus Toyota Racing Development (TRD) alloy wheels and BFG All-Terrain tires with wheel locks. The Special Edition also preps the FJ Cruiser’s body and interior for trail driving. The power-side mirrors feature Illumination markers, and the auto-dimming rear-view mirror integrates a backup-camera monitor. The water-resistant seats, rubber-type floor and rear deck make it easy to clean the trail out of the FJ Cruiser Trail Teams Special Edition, while 12V/100W and 115V/400W outlets enable the driver to keep “plugged in” to civilization when necessary. In addition, the Special Edition comes ready for road and trail with a “floating ball” type multi-information display, remote keyless entry, cruise control, rear privacy glass and rear wiper. The final touch is a Trail Teams exterior badge. 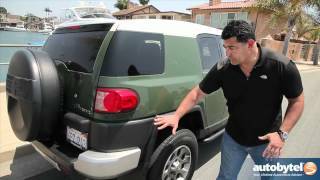 The FJ Cruiser is powered by DOHC 4.0-liter V6 engine that specifies regular-grade fuel. This powerful, responsive V6 incorporates dual independent Variable Valve Timing with intelligence (VVT-i = variable phasing for both the intake and exhaust cams) and produces 260 horsepower and 271 lb.-ft. of peak torque. The broad torque curve facilitates easy cruising on or off-road. The FJ Cruiser meets the stringent LEV II/Tier 2 Bin 5 emissions certification. The 2012 FJ Cruiser is available in 4x2 or 4x4 configurations. The 4x4 offers a choice between a six-speed manual transmission and an electronically shifted five-speed automatic transmission; the 4x2 model is equipped exclusively with the five-speed automatic. The automatic transmission varies the shifting pattern based on road conditions and driver input. A Flex Lock-Up feature allows the clutch in the torque converter to maintain a half-engaged position, enhancing fuel efficiency and increasing the lock-up clutch's operational range. The driver can manually shift the automatic transmission using a console-mounted, gate-type shift lever. The gearshift position is also displayed in the instrument panel. The FJ Cruiser's two-speed transfer case provides a 2.566 low range. With the manual transmission, the transfer case uses a TORSEN® limited-slip center differential with a locking feature and distributes the engine's power 40:60 under most driving conditions. The TORSEN unit varies power distribution as needed, based on steering angle and wheel slippage. In the Lock position, the differential switches to a 50:50 power distribution. The 4x4 FJ Cruiser with the automatic transmission employs a part-time four-wheel drive system with a 3.727:1 rear differential ratio and provides a 33.76:1 crawl ratio. With the manual transmission, the front and rear differential ratio is a lower 3.909:1 for a crawl ratio of 41.84:1, an attribute that helped the FJ Cruiser traverse California's famed Rubicon Trail. An electronic locking rear differential is standard with the manual transmission and optional with the automatic transmission. The ring gears in the 4x4 FJ Cruiser's front and rear differentials measure eight inches. The 4x2 model comes standard with a virtual automatic limited-slip differential, provided and operated by an advanced traction-control system to enhance traction of both rear wheels in slippery driving conditions. Toyota engineered the FJ Cruiser for serious trail driving capability. Its tough, wide stance is based on a boxed steel ladder-braced frame to which the welded steel body is mounted. Skid plates for the engine, transfer case (4x4 models only) and fuel tank are standard. Double-wishbone independent front suspension offers 7.87 inches of wheel travel for outstanding suspension articulation. Its geometry is optimized for excellent road feel and ride comfort. The solid rear axle uses a four-link coil-spring suspension system with a lateral rod, tubular shock absorbers and a stabilizer bar. This system provides 9.1 inches of wheel travel. The four-wheel disc brake system uses ventilated 12.6-inch front and 12.3-inch rear rotors. The FJ Cruiser employs a variable-ratio, hydraulically assisted rack-and-pinion steering system. Standard wheels are 17-inch steel with P265/70 R17 tires; aluminum-alloy wheels are available. With the FJ Cruiser's standard 32-inch tires, ground clearance is 9.6 inches (8.7 inches for 4x2 models). Approach and departure angles are 34 degrees/31 degrees for the 4x4 model and 32/30 for the 4x2. Maximum towing capacity with the optional Class Four receiver hitch is 5,000 pounds. The FJ Cruiser’s comprehensive standard safety package includes front seat-mounted side airbags, and first- and second-row roll-sensing side curtain airbags. Dual-stage front driver and passenger advanced airbags deploy based on impact type and severity. Additionally, the FJ Cruiser is equipped with active headrests for the front seats: In certain rear collisions, a cable-actuated mechanism in the active headrest moves the headrest upward and forward to help limit the movement of the occupant's head. The LATCH child-restraint system secures child seats. 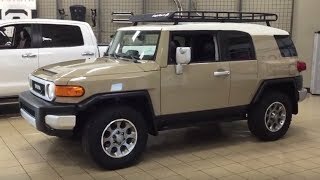 As with all Toyota models, the FJ Cruiser is equipped as standard with Toyota's STAR Safety System™ that includes Vehicle Stability Control (VSC),Traction Control (TRAC), an Antilock Brake System (ABS), Electronic Brake-force Distribution (EBD), Brake Assist (BA) and Smart Stop Technology, Toyota’s brake override system. The roll-sensing side curtain airbags can detect a potential rollover and signal the VSC system to help reduce a lateral skid. In addition, the rollover sensor can signal the standard seat-mounted side airbags and side curtain airbags to deploy. With styling cues reminiscent of Toyota's famed FJ40 4x4 utility vehicle, sold in the U.S. from 1960 to 1983, the FJ Cruiser conveys a capable, contemporary spirit. The original FJ40, which during its production life served around the world as the safari and expedition vehicle of choice, is today a sought-after collectable. Heritage-design features include a front grille with two round, five-inch headlights, reminiscent of the FJ40’s frontal styling; the hood and fender contours; and a rear-mounted and exposed full-size spare tire with an off-center license plate mount. The FJ Cruiser’s side access doors open 90 degrees in clamshell fashion for easy rear-seat ingress and egress. Additionally, a swing-up glass hatch is incorporated into the side-hinged rear door. The glass hatch opens independently of the rear door and helps accommodate longer items. The angular wheel arches open to provide maximum clearance for the FJ Cruiser's large 32-inch tires at full suspension deflection. The arches are edged by flexible fender flares that resist damage during trail driving and also from opening doors of adjacent parked vehicles. Three wiper arms provide nearly complete coverage of the wide windshield. The FJ Cruiser's interior combines a heritage-inspired design with the comfort and convenience of a modern Toyota SUV. The dash is bordered by upper and lower tubular forms, which frame rectangular-shaped flat panels. Large control knobs provide easy grip, even when wearing gloves. The standard full gauge package – including speedometer, tachometer, amp meter, temperature gauge and fuel gauge – uses round, black-white dials for enhanced visibility. Switches for major functions, including climate and audio controls, and the optional locking rear differential, are mounted in the center dash panel within easy reach for the driver. The driver’s seat is eight-way adjustable, while the front passenger seat offers four-way adjustment. Seating materials are not only water-repellant, but also provide excellent ventilation. The seating fabric is backed by a special breathable resin coating, which helps it to shed liquids and make cleanup easier. Even the stitched seams of the seat covers are treated with sealant to prevent liquids from penetrating. The FJ Cruiser's floor surfaces are covered with an easy-to-clean rubber-like material. The rear seatback is split 60/40, with folding (removable) bottom and back cushions that convert to a nearly flat cargo floor. The rear cargo area is equipped with cargo-net hooks, multipurpose grocery-bag hooks and sturdy, floor-mounted cargo tie-down anchor points. A 115-volt accessory power outlet is available. The FJ Cruiser’s long list of standard features includes: air conditioning; power windows and door locks; water-resistant seats; tilt steering wheel; four cup holders and two bottle holders; rear-window defogger; rear-door-mounted full-size spare tire; front- and rear-tow hooks, and mudguards. An available Convenience Package includes keyless entry; cruise control; power side-view mirrors with illumination markers; daytime running lights; rear privacy glass; rear window wiper and a spare tire cover. This package also includes a rear backup camera integrated with an auto-dimming rear-view mirror. The FJ Cruiser can further be upgraded with comfort amenities without compromising its rugged capability. Available features include a floating ball type multi-information display (compass, inclinometer and temperature gauge); JBL Premium Audio system; an 115V AC power outlet; 17-inch alloy wheels; leather-wrapped steering wheel with integral audio controls and cruise-control function; metal-colored shift lever; and interior door-trim inserts keyed to the vehicle's exterior color. Toyota dealers offer a catalog of available accessories, including auxiliary driving lights, rock rails, roof rack, brush guard, taillight guards, sport exhaust system, receiver hitch and harness, wind deflector with off-road lights, a cargo mat and all-weather or carpeted floor mats.